EBBD+ dissemination event for Lower Saxony/Germany a full success. 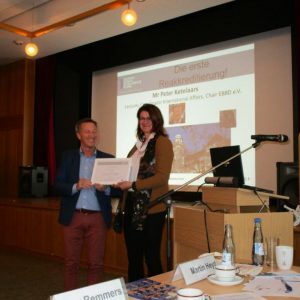 A majority of the business colleges accredited as European Schools in Lower Saxony attended the Regional Dissemination event of the Erasmus+ KA2 project “European Business Baccalaureate for all (EBBD+)” at the end of 2016 in Hamelin, Lower Saxony. This event was supported by a representative of the federal state educational authority of the capital of the federal state of Lower Saxony in Germany. The event was located in and organised by the EBBD pilot school for Lower Saxony, the Handelslehranstalt Hameln. International key speakers from Finland, the Netherlands and different regions of Germany presented the key elements of the certificate of excellence “EBBD+” during lectures and various workshops. Kaisa Nuutamo (manager at Helsinki Business College, Finland), representing both the registered association EBBD e.V. and the coordinating business college of the Erasmus+ KA2 project “European Business Baccalaureate for all (EBBD+)” gave an instructive and in-depth view on the project, it’s development, means of implementation and on the incorporation of elements of recognition of informal/non-formal learning including adult learning. In this way the certificate of excellence EBBD+ supports one of the key elements of the Europe 2020 strategy by enhancing skills and employability for graduates, leading to a modernisation in the VET sector across Europe and fostering the international dimension of education and training. Peter Ketelaars, chairperson of the registered association EBBD e.V. and international coordinator of the Dutch Summa Business College in Eindhoven, another partner in the pr oject EBBD+, took a closer look at the different constitutive components of this label of excellence before the participants came together in further workshops on the topics work placement abroad, accreditation requirements and procedure, serious business games/projects and implementation possibilities of CLIL considering the curricula predominant in the federal state. One of the highlights was the re-accreditation of a business college from Ludwigshafen (Rhineland Palatinate), the BBS 1 Ludwigshafen, by the chairperson of EBBD e.V., thus proving and illustrating the sustainability of this concept. The convincing conception of the certificate of excellence EBBD+ led the participants of this event to spontaneously found a regional network of schools thriving to be accredited as EBBD schools. Schools already accredited are also members of this regional network and thus can hand on their experience, expertise and competence to those setting out to reaching this higher degree of excellence. At the end of the day all participants left Hamelin with the strong intention to be a part of this development – EBBD e.V. is looking forward to greeting these new members.